All of us have positives and negatives within us but not all of us would confront our negatives. Positives do get their own share of publicity. So last week in our creative writing prompt 'Me Against Myself', we made these traits in our bloggers clash in a fictional story. We are amazed with all the stories and below are the links that will allow you to understand the good and bad within, in a creative way. 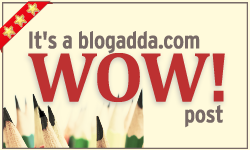 Thank you Blogadda for selecting my post. I lived writing it. Hello! I am new to Blogadda and need some help understanding how WOW works..When does it open and when is the last date to submit posts?